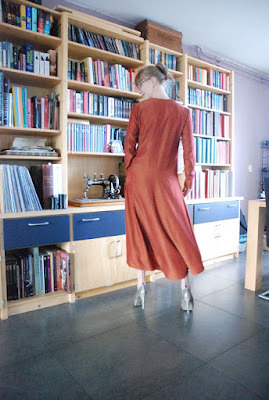 I have never really made anything especially for Easter but it just so happened that today, I did finally finish my new 1929 dress (I also made a dress from a pattern from 1929 back in 2014 but that was a different one, from a different issue of the same magazine). 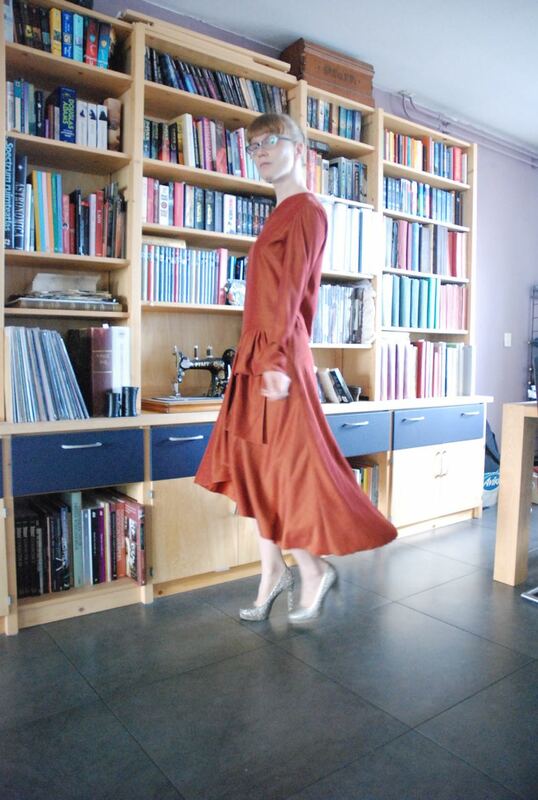 This new dress was the first thing I started on in January of this year. 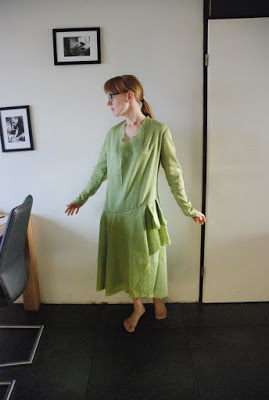 A first entry for the Vintage Sewing Pattern Pledge before the new pledge had even been announced. However, work on it slowed down almost as soon as it had started. I had thought I had a suitable fabric for it but started second-guessing myself. I made a toile which showed the familiar 1920's sack shape. Maybe period-accurate but really a bit too sack-shaped for my taste. I played around with it but ultimately moved on to other projects. In the mean time, I kept thinking about a fabric for this dress. And then, a few weeks ago, I found something. This flame-coloured (possibly) viscose/rayon. It seemed to have the right kind of hand for a dress like this and colour which might work for me and it was on sale. I bought it and decided the dress would have to be made now. For a while, I kept looking for some kind of trim to use with it but in the end I just went ahead. 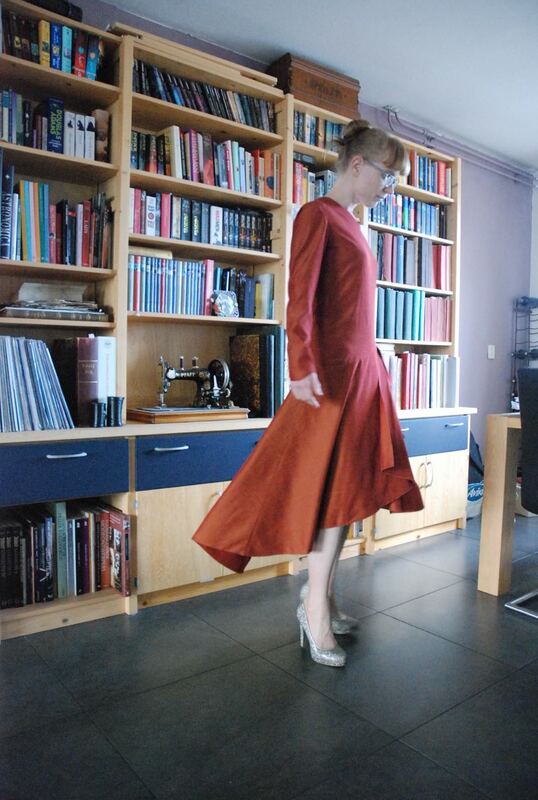 Before I cut the dress pieces from the new fabric, I went back to the muslin and tried to take some decisions about the fit. 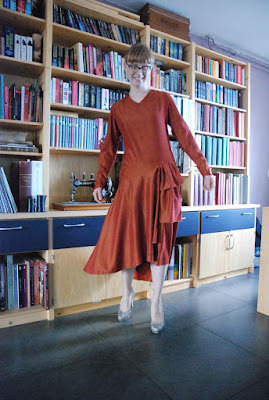 Initially, I had thought about making a pleat on the horizontal seam to make it sit on my hips. Now, trying it on again, I thought it would be better to just narrow the all the pieces at that point. And then there was the neckline. The cowl-neck had been one of my reasons to choose this pattern but just didn't work. 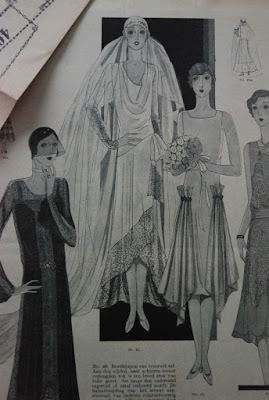 It was drafted like no other cowl-neck I have ever seen (except some in other 1920's and 30's designs from Gracieuse magazine): Basically just a scoop neckline with a lot of extra room in the entire front bodice. It also made the armscyes sit in a rather awkward way. If I pulled those in the right position, the neckline looked sort of like a cowl-neck. I toyed with the idea of retro-fitting a more fitted inner bodice layer but I finally came to a much simpler solution: I took out about 10 cm at center front. This meant sacrificing the cowl-neck but fixing the armscye and overall ease issues in one go. The original front bodice was so wide that even with all that width taken out, it is still a bit wider than the back bodice. I narrowed the front skirt pieces by 5 and 7.5 cm (they overlap at the front anyway so that was not really a fitting issue). Sewing the dress wasn't difficult. I did sin against period accuracy by using my serger, not just to finish the seam allowances but even to make tiny rolled hems on those flouncy skirt pieces and on the decorative sash on the skirt. The very short instructions for this pattern also suggest narrowly hemming the neckline and sleeves but I made facings instead. It is finished now and I love it so much more than I had expected! (which is exactly what happened last time...). The alterations I made actually make it fit much more like the illustration suggests. The dress has a fairly loose fit but certainly not so loose that you cannot even see that there is a body in it. This feels like a proper start to this year's Vintage Sewing Pattern Pledge, even though it technically is my second finished item. After this, I'll start on a casual 1950's capri suit. The pattern has been tested out, it will work with fabric in my stash so it is all ready to go. Looks really elegant. Glad it worked out so well. LOVE this! The fabric is great and that hem is so flattering! Your tweaks makes a much more wearable dress. Lovely. Here in Australia we don't generally buy Spring (or Autumn) specific clothes. I was just discussing this with my daughter yesterday. Yes there are new clothes in the shops for each season but we do (and can) wear anything all year round. Just layer up if it is cold. We live in Melbourne and black is in season all year round! lol.. 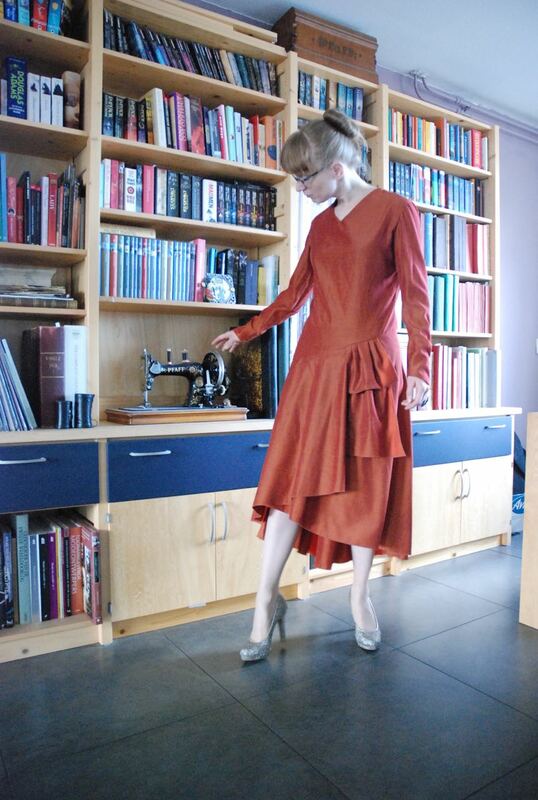 Your finished dress looks so much better than the original toile, fantastic job! I think it was worth sacrificing the cowl neck for and it gives it that in-between-decades look of 1929-1930 when the silhouette began slimming down.